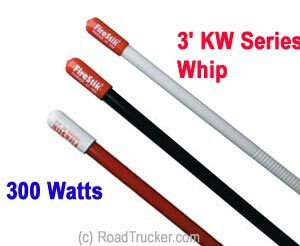 FireStik KW Series 300 Watt Whip Antenna uses a heavy-duty coil that increases the transmit/receive functions of your CB. The KW-3 also has the capability of receiveing NOAA weather emergency alert and national weather broadcasts for radios with those features. Choose among 3 Colors - Black (KW-3BK), White (KW-3WH), and Red (KW-3RD). Original "Cut-to-Tune" FireStik "KW" Series 40 Channel Plus CB Antenna is well-loved wire-wound CB antenna in the world since 1975. You can use this with trucks, RVs, autos, motorcycles and ATVs in a single antenna configuration or in dual (co-phased) configuration on any vehicle made from any type of material. The "KW" antennas are need be tuned (SWR) after placing it on the vehicle. The loading coil is easy-to-access for accurate SWR adjustments.